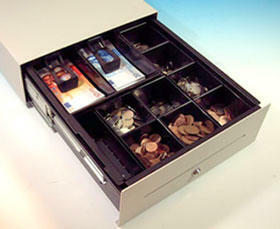 The APG CashPlus Flexi provides a compact but high capacity cash drawer facility. Manufactured from a robust steel construction and steels ball bearing runners the CashPlus Flexi is ideal for a varied range of retail or hospitality environments. Lay flat or vertical note storage. Options Lockable lid for insert. Dimensions W330mm x D427mm x H121mm.